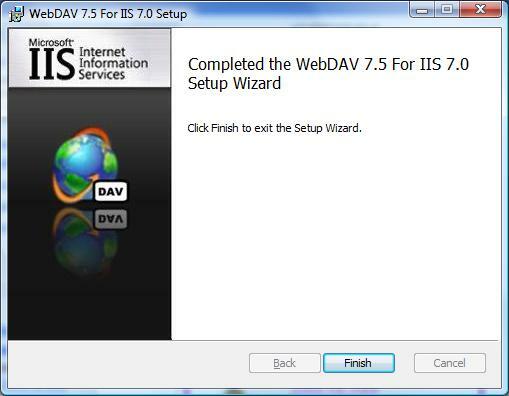 For Internet Information Services (IIS) 7.0 on Windows Server® 2008, Microsoft released a separate, downloadable WebDAV extension module that was completely rewritten. This new WebDAV extension module incorporated many new features that enable Web authors to publish content better than before, and offered Web administrators more security and configuration options. 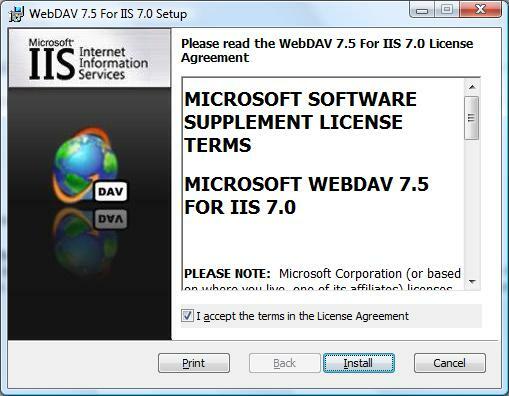 With the release of IIS 7.5, support for a newer WebDAV module was built-in for Microsoft IIS, and Microsoft released an updated version of the downloadable module that had been released for IIS 7.0. This newer version of the WebDAV module provides shared and exclusive locks support to prevent lost updates due to overwrites. 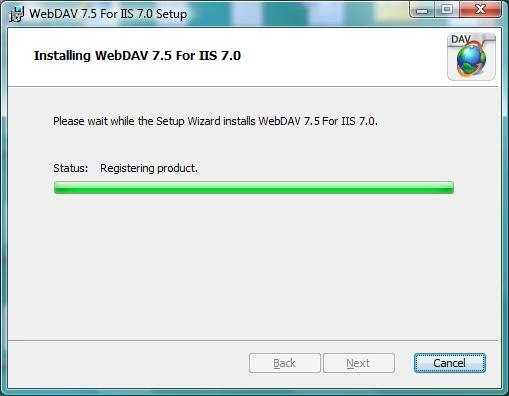 This document walks you through adding WebDAV publishing to an existing Web site by using the new WebDAV user interface and by directly editing the IIS configuration files. This walkthrough contains a series of steps in which you log on to your Web site using the local loopback address and the local administrator account. When using an administrator account, these steps should only be followed on the server itself using the loopback address or over SSL from a remote server. If you prefer to use a separate user account instead of the administrator account, you must create the appropriate folders and set the correct permissions for that user account when necessary. This topic discusses using the WebDAV Redirector to connect to your web site. Please see the Using the WebDAV Redirector topic for more information; specifically the "Troubleshooting the WebDAV Redirector" section if you have trouble using the WebDAV redirector. At least one authentication method must be installed. If you choose to use Basic Authentication with the WebDAV redirector, you must connect to your server using HTTPS. Logging in to your server using the actual account named "Administrator", then browsing to the download pages listed above or double-clicking the download package if you have saved it to your server. When the installation package opens, you see the following screen. If you agree to the license terms, check the "I accept" box, then click Install. The progress indicator will reflect the status of the installation as it proceeds. The WebDAV extension module is now installed. 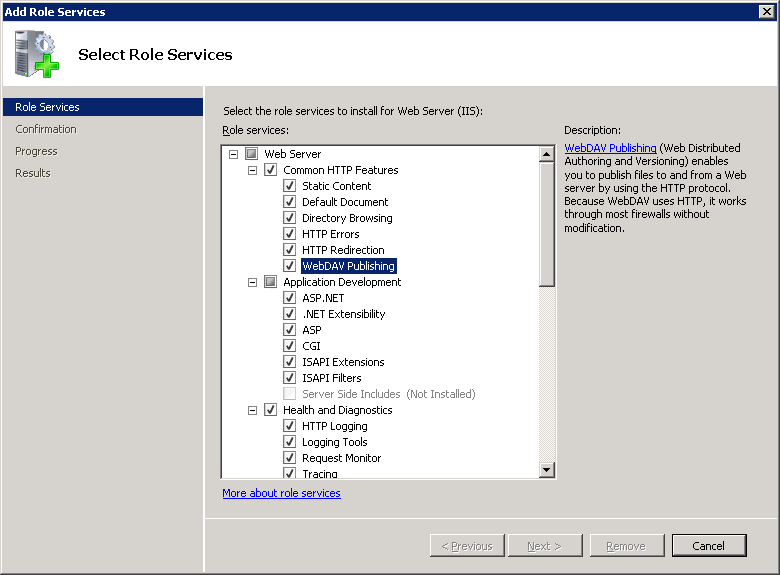 On the Select Role Services page of the Add Role Services Wizard, expand Common HTTP Features, select WebDAV Publishing, and then click Next. Select WebDAV Publishing, and then click OK.
On the Select Role Services page, expand Web Server (IIS), expand Web Server, expand Common HTTP Features, and then select WebDAV Publishing. Click Next. Confirm the installation selection, and then click Install. The WebDAV extension module makes it easy to add WebDAV publishing to existing sites by providing you with a wizard that walks you through all of the required steps. In this first step, we add WebDAV publishing to the Default Web site, and add the required settings to allow the local administrator account to edit the content. As shown in the image below, double-click the WebDAV Authoring Rules feature. When the WebDAV Authoring Rules page is displayed, click the Enable WebDAV task in the Actions page. 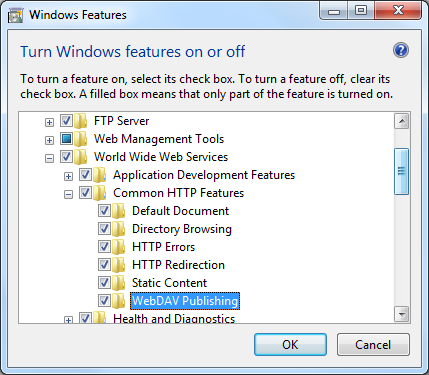 Once WebDAV has been enabled, click the Add Authoring Rule task in the Actions pane. Click All content to specify that the rule applies to all content types. Choose Specified users and type "administrator" for the user name. Select Read, Source, and Write for the permissions. When you have completed these items, click OK. Task completed. You have enabled WebDAV authoring on an existing Web site. Enabling WebDAV for the Web site. 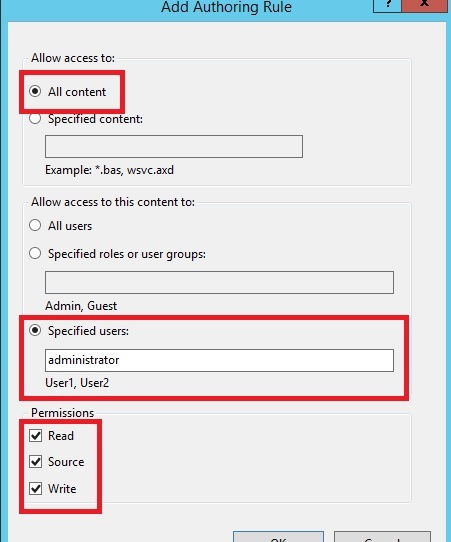 Adding an Authoring Rule for the local administrator account for Read, Source, and Write access. As mentioned earlier, your default request filtering settings may block several file types from WebDAV authoring. If you do not modify your request filtering settings, you may see various errors when you try to publish files that are blocked. For example, if you attempt to upload or download a web.config file you will see errors in your WebDAV client. For more information about configuring your request filtering settings, see the How to Configure WebDAV with Request Filtering walkthrough. In Step 1 above, you enabled WebDAV publishing for your Default Web Site and added an authoring rule for the local administrator account for Read, Source, and Write access to your Web site's content. In this step, you log in using your administrator account. When the Authentication feature opens, make sure that Windows Authentication is enabled. If it is not enabled, select Windows Authentication, and click Enable in the Action menu. > [!NOTE] > You can use Basic Authentication with WebDAV, but the WebDAV redirector will only use Basic authentication with SSL connections. 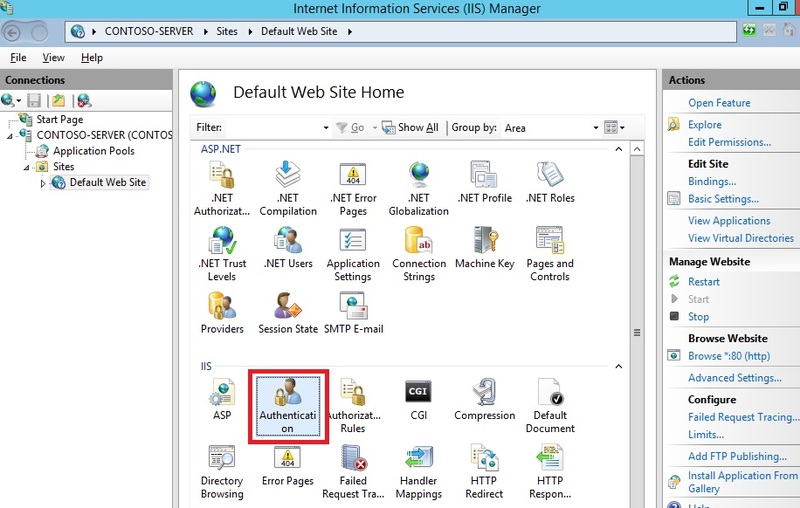 In IIS Manager, click the Default Web Site under the Sites node in the tree. Double-click the Authorization Rules feature. Logging into your WebDAV site requires the WebDAV Redirector. The WebDAV Redirector is used to publish content to an existing Web site that has the WebDAV module installed. You must use Server Manager to install the Desktop Experience feature before you can use the WebDAV redirector. For more information, see Using the WebDAV Redirector. 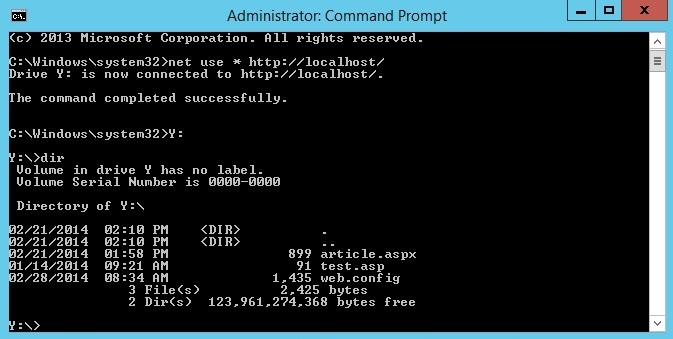 On your WebDAV server, open a command prompt session. You now have a drive mapped to your WebDAV-enabled web site using the local administrator account, and based on the authorization rule that we added in Step 1, you have Read, Write, and Source access to the content folder. You verified that your Web site had sufficient authentication and authorization settings. You logged in to your WebDAV site as the local administrator. 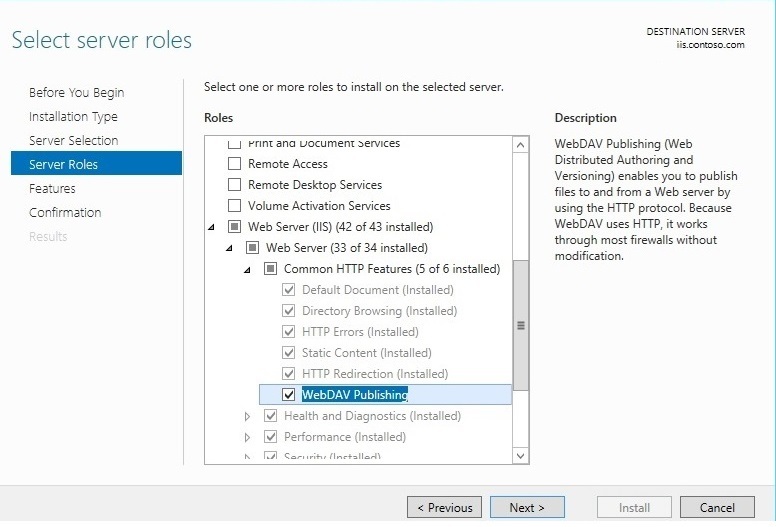 You can also add WebDAV publishing to an existing Web site by editing the IIS configuration files. 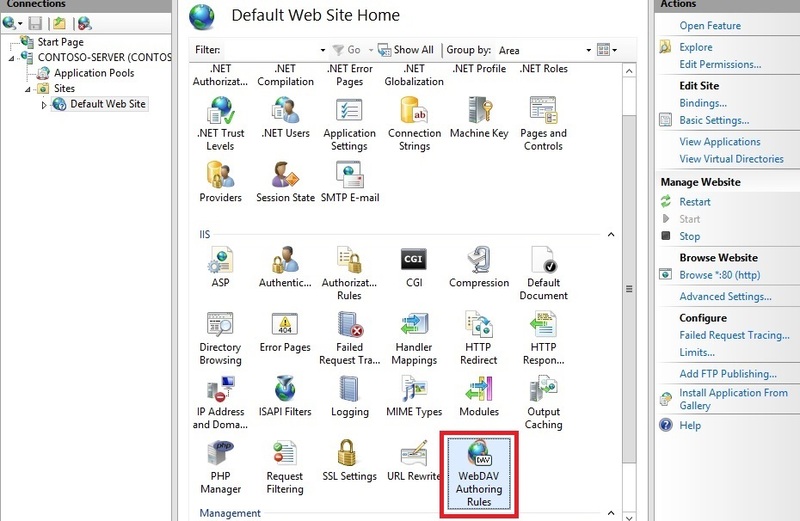 The following steps will walk you through all of the required settings to add WebDAV publishing for the Default Web Site. Make sure that you have Windows authentication method enabled. Add a <webdav> section beneath the closing </authentication> tag that will contain your WebDAV settings. Add an <authoringRules> collection with a single entry for <add users="administrator" path="*" access="Read, Write, Source" />. You should now be able to log in to your WebDAV-enabled site using a WebDAV client using the administrator account, but no other users should be able to access the content using WebDAV. You enabled Windows Authentication for the Default Web Site. You enabled WebDAV for the Default Web Site. 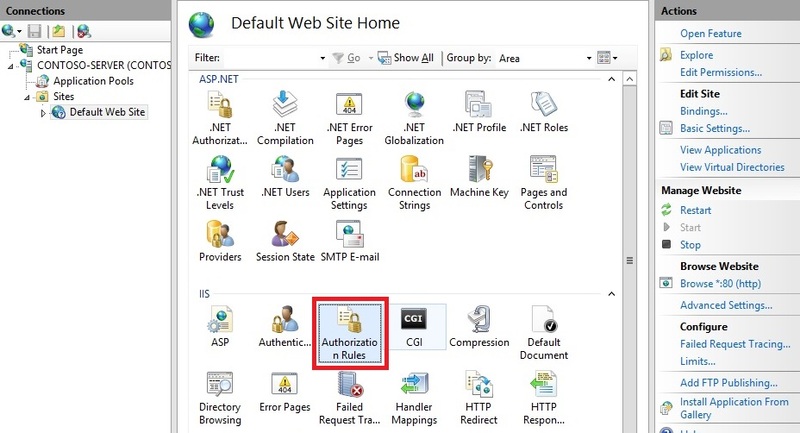 You added a WebDAV authoring rule for the administrator account with Read, Write, and Source access to the Default Web Site.